Correct TWo INitial CApitals – This is useful if you tend to be a little slow in taking your finger off the shift key when you’re spelling a word that starts with a capital letter. I benefit by having this one turned on. Capitalize first letter of sentences – This is the setting that really prompted this whole tip, as someone wanted that behavior to *stop*. I’m not sure I’d do that, but the option exists. 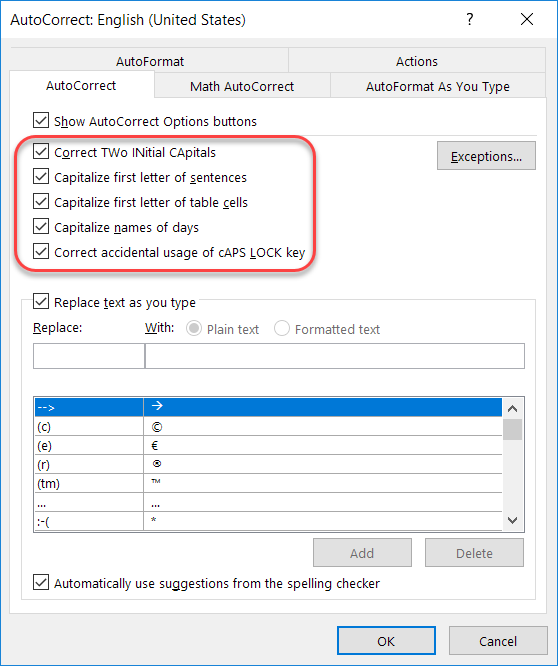 Capitalize first letter of table cells – Depending on how you use tables and what you put in them, you may not want individual words to be capitalized. This will prevent that if you turn the option off. Capitalize names of days – I will occasionally type too fast and end up with friday instead of Friday. I like that Office fixes that. Correct accidental usage of cAPS lOCK key – I LOVE this one… especially how they present the option in the dialog box. Granted, I touch-type, so I usually catch a Caps Lock issue after one or two words, but I like how it would fix it automatically for me if I wasn’t paying attention.